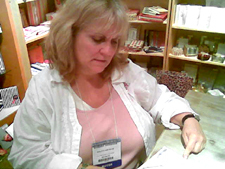 The Los Angeles Gift Show at the LA Mart… yippee! I have a very short attention span… I am easily overwhelmed when the senses are bombarded. 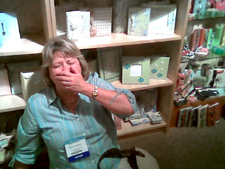 The gift show… it is just one of those things that I cannot “do” for too long. Cindy, Rachael and I went last Tuesday and found some great products and today, Babs, Pam and I went… and boy oh boy, was it crowded. The whole gift mart/gift show thing is an odd animal. 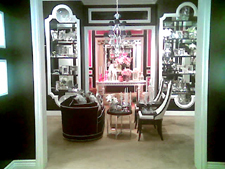 In Los Angeles, during the “gift show” active showrooms exist in the LA Convention Center, the LA mart and the California Mart. All within a few miles of each other. Legend has it (since I’m a newbie… oh, and have I mentioned I have a short attention span, this is how fables start…) that every top cookie in the gift merchandise world had a showroom at the LA mart. Then, for some reason, some of the showrooms moved over to the California Mart or Market place (I’m probably saying this wrong). I’ve been told that showrooms moved over to the California Mart because it is new and shiney. I personally feel being all in one building is better, but… whatever. So, we spent most of our time at the LA Mart for some reason. I guess I get completely exhausted trying to see everything at the Convention Center and I really just wanted to scour the mart this time. I feel like there was a bunch of new things that we hadn’t seen last January. I took home about 50 pounds of catalogs. 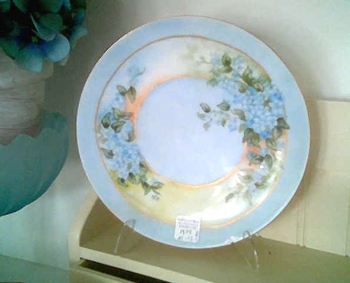 I’m not positive if we were supposed to or allowed to snap pictures of the showrooms, but I figured these were terribly grainy and tiny so the possibility that any of this would be copied would be slim. Again, everything has been done and not absolutely everything here is completely original. 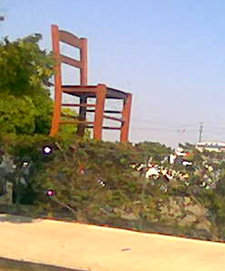 Okay, on your left, the very large chair they have in their parking lot here at the LA Mart. For some reason, they pipe in easy-listening non-offensive Jazz… it’s like Kenny G is following you around! The first showroom you see, and everyone knows this, is Two’s Company. They really do a great job of merchandising! They had some great things this season, lots of black and white with hints of color. This is the entrance to their showroom. Usually they bake fresh cookies and you can smell them all the way out the door into the lobby, but for some reason this wasn’t so this time. It’s funny how you get used to something then expect it (like the voracious consumer I am!). I think I may have to do the cookie thing at the shop this christmas because… it really sticks in your mind, obviously! 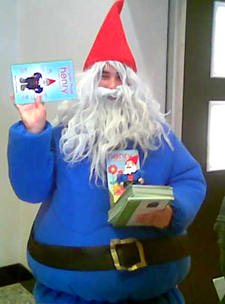 Okay, so perhaps their cookie money went to fund the costume for Henry the Gnome. 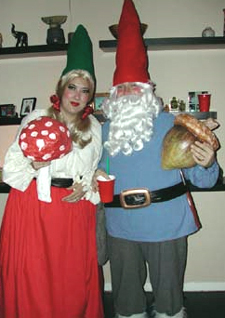 I love his costume, but nothing will ever out-do our friends’ Gnome costumes a few years back. I had to find it and post it…See what I mean ;) They are both artists… just classic! Two’s Company also had these lovely scarves that come wound up in a cupcake bottom… SO super cute! I’m a sucker for anything cupcake related. Okay, so we go into this showroom, but there is a little sign that says “no photos, please”. So, I respect that. There is stuff dangling, hanging and sparkling absolutely EVERYWHERE! They had some really cute things. Some things that I would never carry, the cinco de mayo frogs, the mardi gras grannies… for two examples. 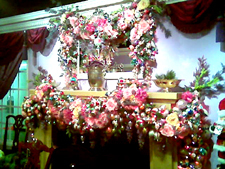 But they had lots of glittery vintage-looking boxes, fake cakes everywhere, amazing custom signage and displays. I was so incredibly impressed with them, I’ll definately go back and order! My Mom walks over with an icy drink in one hand, the straw of the other drink in her mouth… “margarita?” I ask… “no… vodka lemonade icee”. I think this is the first time my mother has presented me with a vodka drink… ever. Either I’m going to get stupid and buy more, or fall down on top of one of the roulette/bingo granny displays (Lots of happy old lady dolls, for some reason). OH! and they also had a doggie birthday display… little party hats on doggie stuffed animals, little frilly neck thingies… I must get them! 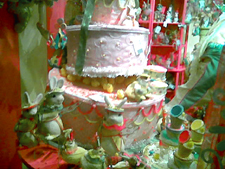 The picture shown here is a bad pic of their sweets shop easter display… it was so much fun. 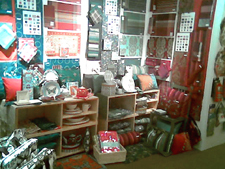 This blurry picture is deceiving… in person it’s the most beautiful linen display! Rachael found these and I’m really excited to get them! Damask print blues, greens, birds, trees and silver accents with tons of pillows, teapots, tea cozies, floor mats and aprons! 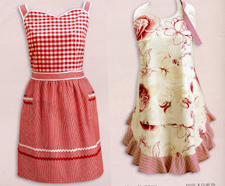 Lots of cute aprons! 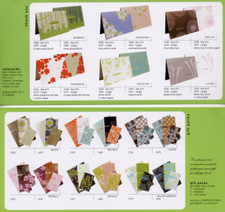 They also had matching paper napkins in all these fine prints… now, to find the melamine! Here is Pam. She is sitting on the floor and was laughing at the “… I think I have a disease” comment… *sigh* it was tough keeping these two in line today. We found these neat candles in glass cups that smelled awesome! With a little help from Susan, I found the line that included these paper cards that turn into crowns! They have glitter and ribbons and they are so cute! A line of really fun bib aprons! This company had an entire line of home decor, but the matching matchboxes were awesome! 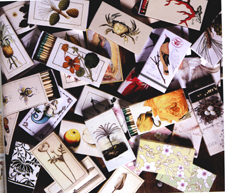 Not only were the outsides of the boxes beautiful, the matches inside, well…matched! (“are you good with puns? ?”) So, the matchbox with the roses on the outside had pink flinty things, some of them had dark brown wood… some light. They are neat-o! I may buy them and then glue a few little flatback crystals here and there. Also, they have matching little ceramic trays… perfect for a candle, some bath salts and these matchboxes… I’d want that gift! These cards had really fun patterns on them. Some of the sets came with cards and envelopes… some came with cards, envelopes and a little flipbook. So cool! This damask print will go with the halloween items and then the wonderful Christmas items, too. Lots of proper-french, english manor cottage… whatever it is…. items coming in for Christmas. Formal, yet flirty. I think the point has been made. If I like this wallpaper at the shop, our bedroom is next. Sorry Nathan. At least it’s not pink! That’s really all I know. Last time poor Cindy G. agreed to put up our wallpaper… what a sport! So, retail land is slumber-time during the summer… especially with the record breaking heat we’ve had this year. 1. You will be bombarded by vendors all summer. I’m a tad in shock at this point…. Me: “Fine…” I go and get the folder…. 2. It’s hot. People are in a bad mood. People want to be in an air conditioned environment and get lots of attention. It’s 78-80 in here and I can give you attention, but I can’t perform miracles. That said… we got a ceramics banger in today who was looking at a set of 5 bowls, a nut bowl set, hand painted… retails for $83.00, these are slightly rare. Boy, if I could have a time-traveling device I would SO go and grab all the expensive antiques and hoard them… but alas, I cannot and we do get onsies. I like the idea of all onsie plates, cups and saucers in my house… more fun that way. 3. You won’t have what they are looking for. I just got 20 boxes of Halloween and fall items. They aren’t all out and displayed… if you’ve seen the way I plan for displays, you will be aware of the fact that it takes me a while to plan and assemble. 50% of my customers want it all out and displayed… with happy little ghosts, witches, pilgrims, indians… the whole bit. The other 50% are annoyed with the idea of Fall items being out this early. I figured mid-August is a good compromise… with a party at the end of September… we shall see. Also… we are running low on silk florals. I am not quite sure what to get… We mostly sell springy pastel items but with the fall coming, I would like to get the darker, richer colored arrangements. eek! Do I wait, do I go now… another quandary. Oh, and apparently, I don’t have enough lamps. pass it on. 5. Your electric bill… it will be huge. Such as candy, little games, books, dvd’s… or tell them that little people live under the carpet… anything to keep them distracted. If I were little, I would find the shop quite boring, too. How does this affect us you ask? Well, when you are on your way out at 6:30, you will get people coming in to shop… not knowing it is indeed, 6:30, thinking it’s more like 5:00… so, stay longer! in bunny mode, so put on those lop-ears! Here comes spring and Easter. You should have already ordered Valentine’s day, which I have… mostly. 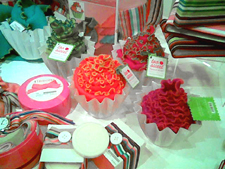 We went to the gift show last Tuesday and found the most amazing things! An awesome line of candles, the most amazing linens EVER, some neat chocolate gift sets for christmas, more soaps… and books! We’re going again this Sunday and perhaps I’ll be more aware of what I am doing and take pics of all the goodies we encounter! I guess this is all general information… common sense if you will… but, it’s all sort of a lesson to me! We’ve been in business over 3 years and I’m still learning on a daily basis! Nathan just got me a shirt that says “I’m blogging this”… HA! I’ll wear it when I desire customer service… would that even make them flinch?? One thing I can tell you for sure… a 12 foot pool-in-a-box put together and filled with water on a slightly sloped back yard is a bad idea. I got a pool-cleaning net, chlorine, the whole bit… couldn’t keep that thing clean to save my backside. So, it’s fun for about 3 days… after that… no. A gigantic waste of $100 plus whatever water costs you… and when you drain it, you have to do it a little at a time over the course of a few days. The birds loved it tho. It’s Saturday, normally our most busy day of the week. It’s 2:00 pm and 7 people have come in. This week has been similar too. So, I noticed it was 80° inside the shop… let me check weather.com. How can it be 108° ?!?! So, I’m sitting here… fan at my feet… wondering how I’m going to kill time. Last night Cindy, Cathi, Nathan, Melissa, Octavio, 2 other friends I didn’t meet and I went to see Tom Jones at the Hollywood bowl. Tom Jones. Not usually my favorite… but the man can sing AND dance. He’s 66 and he was tearing up the stage! It was hot… boy was it hot… but we had a great time. I spilled perrier down onto the family below, getting all of their belongings sitting on the floor wet. The guy behind me opened a bottle of wine and splashed it all over my back, Cathi was yelled at by a drunken Tom Jones fan in the bathroom (to which Cathi replied, or I think at least she wanted to reply… “Sorry Ma’am, I don’t speak beer!”… it was a great night. Memorable… and hot. Do you run into the occassional… well… “emotional unloader”? I have no other way to put it… but that is what it feels like. 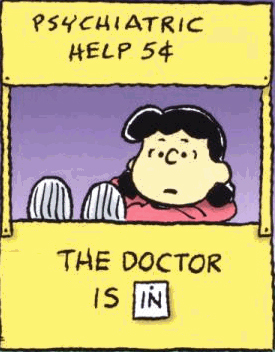 I have a few customers who come in and tell me all about their lives, illnesses, problems etc and so on. Don’t get me wrong… I care about my customers and want them all to be happy but somedays… sometimes… several of these episodes will occur in one day and I get extremely overwhelmed. I do not have the tools to take all this sad information and unload it somewhere else. It sticks inside of me and I can’t stop thinking about it. And maybe, just maybe I’ll be able to lighten things up a bit. If any of you out there have any tips, solutions or exercises I can use to get this energy out of me, I’d be SO grateful to hear about it!